Two students in Rural Action’s Youth Act program stunned an audience with their knowledge of stream terminology at the “Faces of Leadership” conference July 11-13 in Charleston, West Virginia. Becky and Jessie Curry, both students at Trimble Middle School, gave a presentation about service-learning at a 90-minute workshop. 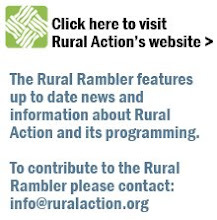 “They did a wonderful job talking about the service-learning project they did at the Trimble Middle School,” said Mary Steinmaus, who facilitates the Youth Act program. 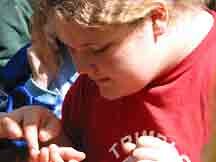 Becky and Jessie described a project that took place during winter and spring of 2006, during which they and other students learned about problems in Sunday Creek, a waterway near their school. Through a partnership with the Sunday Creek Watershed Group, the students educated themselves about water sampling, illegal trash dumps, aquatic animals and acid mine drainage. The grand finale was a service-learning project planting 20 native trees near Sunday Creek. 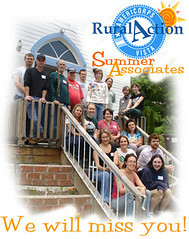 Eighteen AmeriCorps*VISTA Summer Associates, who have been serving with Rural Action this summer, are due to complete their service August 5. To listen in as they talk about their experiences, tune in to "Volunteer Action" on August 8 from 10:06 to 10:36 on 970 AM.